This is a more graphic image that is more fitting for Halloween. 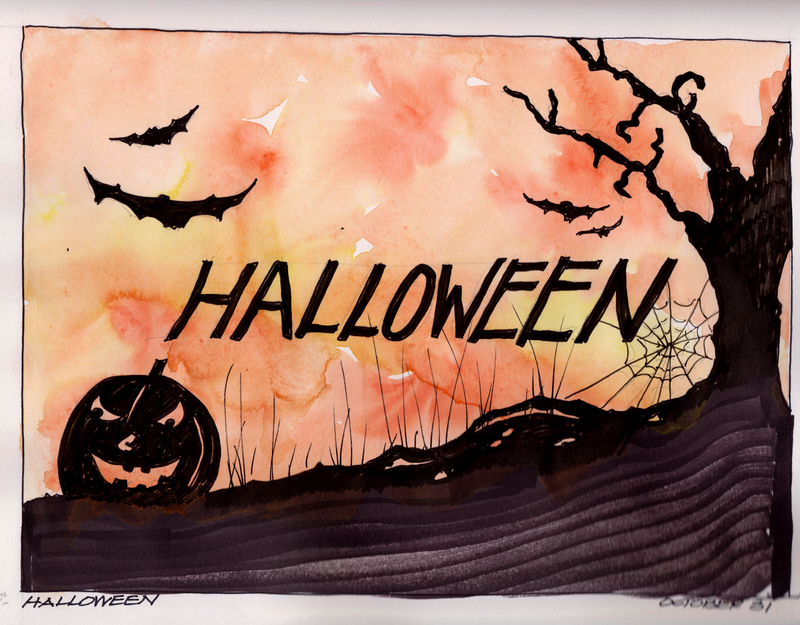 Halloween; a contraction of All Hallows’ Evening, is a celebration observed in a number of countries on 31 October, the eve of the Western Christian feast of All Hallows’ Day. According to one view, All Hallows’ Eve is a Christianized observance influenced by Celtic harvest festivals, with possible pagan roots, particularly the Gaelic festival Samhain. Other scholars maintain that it originated independently of Samhain and has solely Christian roots. Halloween activities include trick-or-treating, attending Halloween costume parties, carving pumpkins into Jack-o’-lanterns, lighting bonfires, apple bobbing, playing pranks, visiting haunted attractions, telling scary stories and watching horror films. 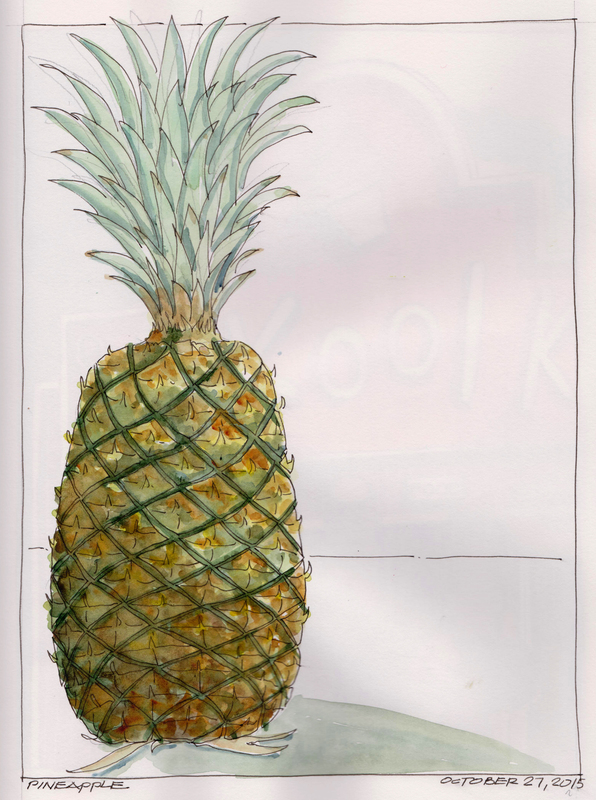 Faber-Castell Pitt Art pens with Holbein watercolors in a Stillman and Birn sketchbook. 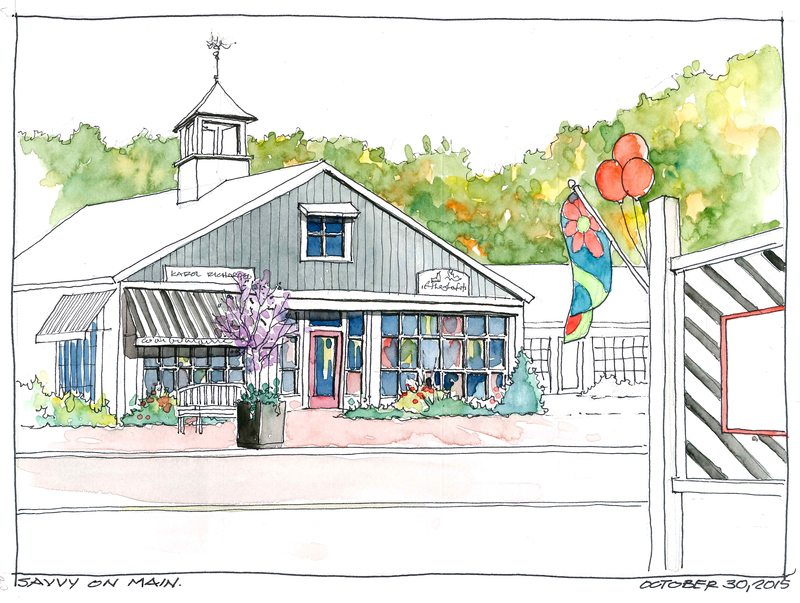 A view of some of the local shops in the quaint village of Orleans, Massachusetts on Cape Cod. 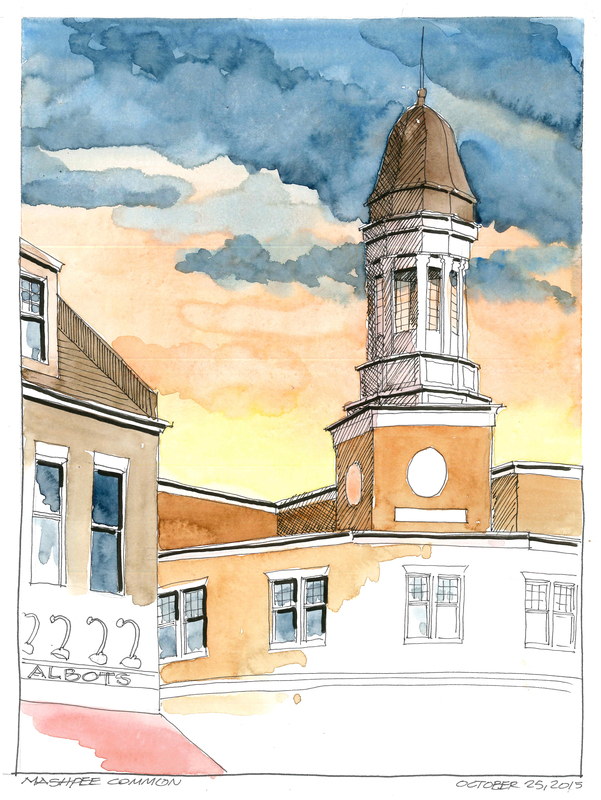 I was sitting in the parking lot of Savvy on Main (part of the foreground sign) sketching the shops across Main Street. 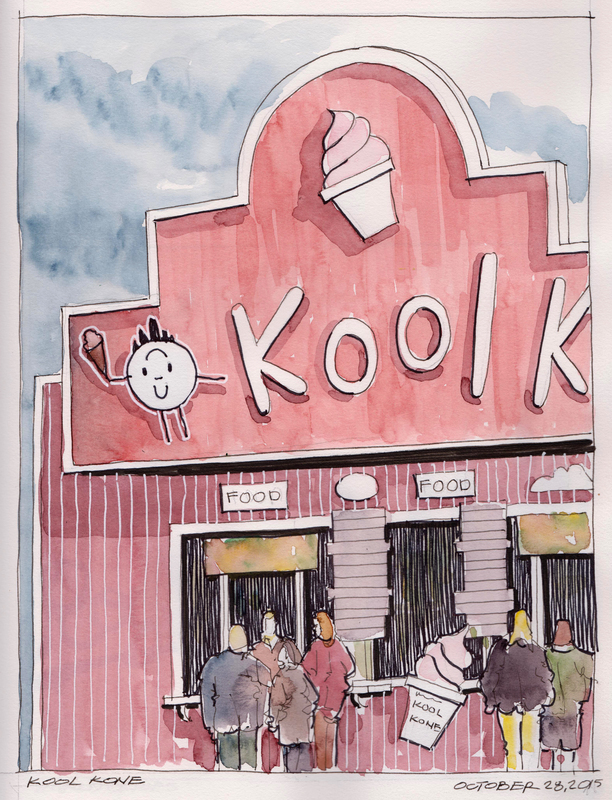 Lamy Safari fountain pen with Noodler’s ink and Pelikan watercolors in a 9″ x 12″ Stillman and Birn Alpha sketchbook. Being a former collegiate baseball player, I love this time of year with championship in baseball ,the World Series, being played. 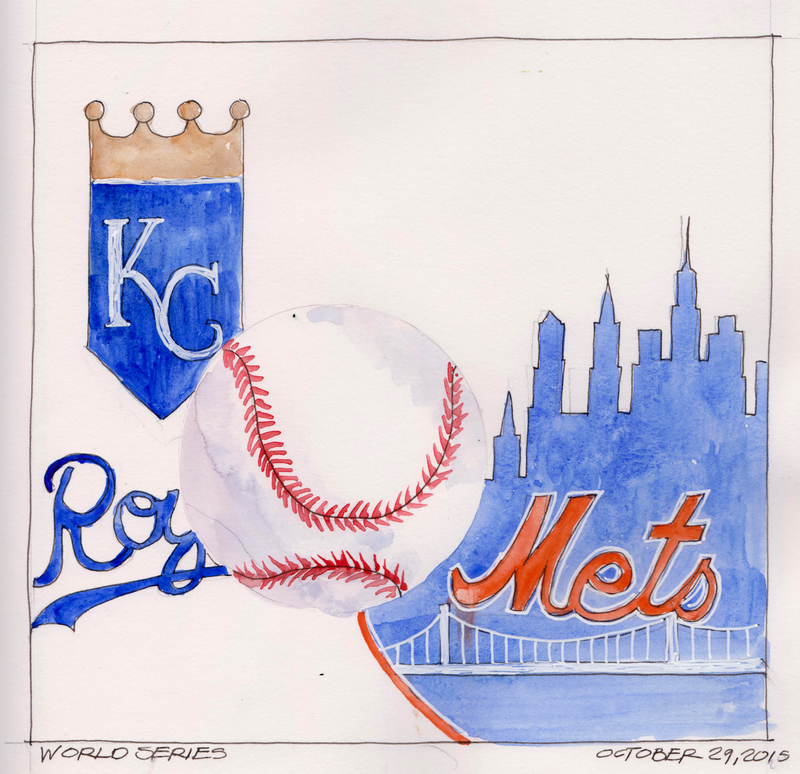 This year it is between the Kansas City Royals and the New York Mets. The Royals have not won the championship since 1985 and the Mets last one it in 1986. This is a sketch of a baseball and the two team logos using a Lamy Safari fountain pen with Noodler’s Black ink and Holbein watercolors in a Stillman and Birn sketchbook. 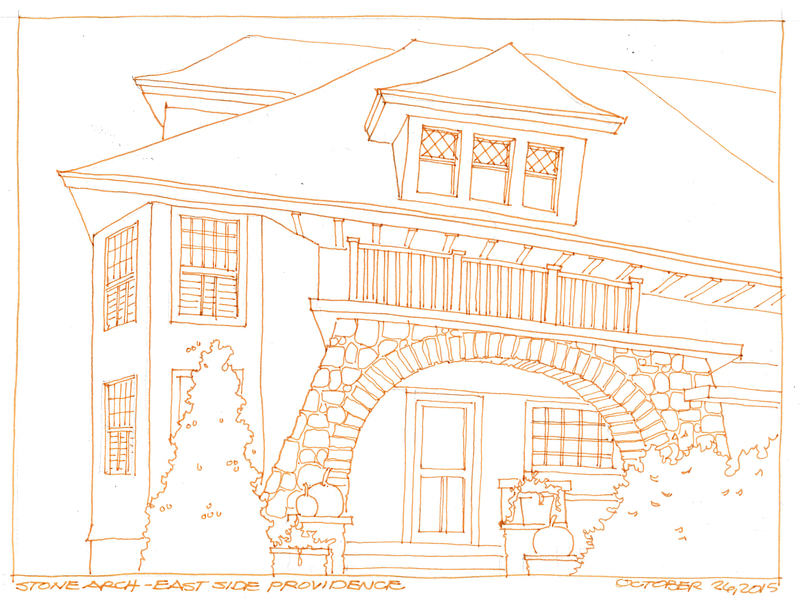 A quick line drawing sketch of a house I drove by on the East Side of Providence, Rhode Island. I was drawn to the beautiful arched entry and stonework on this pretty modest house. Faber-Castell Sanguine Art Pens in a 9″ x 12″ Alpha Series Stillman and Birn sketchbook.